A fiber broadband network is comprised of the physical fiber-optic infrastructure and the internet service. Right now, it is common for ISPs to own the backbone infrastructure in addition to providing the service. 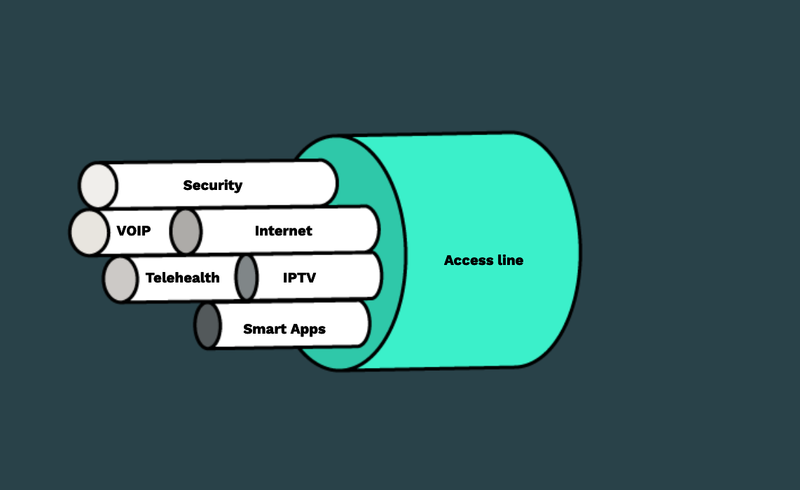 In an open access model, the infrastructure ownership is separated from the provision of services, so multiple service providers can use the infrastructure, and compete on price and service to secure internet subscribers. It’s also worth noting that there is no agreement on what internet speed is required to be considered a “broadband” connection. The Federal Communications Commission (FCC) defines broadband as connection speeds of at least 25/3 Mbps but most ISPs argue that broadband is anything from 10/1 Mbps (this translates to 10 megabits of data per second download, and 1 megabit per second upload). 10 Mbps is generally good enough to stream a 1080p (high-def) video, but 10–20 Mbps is a more reliable speed to stream content and/or make fast downloads, and often an even better connection is required to run multiple applications at once. Fiber networks offer far superior speeds: made of fiber threads instead of copper cable, these networks transmit data at near the speed of light. They also provide symmetrical speeds — in other words, the same speed for download (e.g. video steaming) and upload (e.g. putting a video on youtube or sending a large file to friends). The super-fast transmission of data will give home-based workers fast, reliable, and clear connections to work most effectively; large files can be downloaded in seconds. Students will be able to use the best resources on the internet to carry-out research and complete their homework. Medical personnel can monitor patient health remotely and in real-time. At home, this translates to a fast connection for everything from video chatting with friends, to smart home uses like security cameras. How does the fiber “network” relate to the wifi in your home? Your WiFi is the wireless internet service provided by your ISP. ISPs “lease” the right to use the network to deliver the internet into your home and you pay them for that service. Open access networks allow multiple services and service providers to operate on the network. This arrangement gives customers the ability to pick and choose services, from varying providers, according to their needs and budget. Revenue can be generated through user subscriptions to the network and leasing fees from ISPs who also pay for the right to use the infrastructure. Open access: An open system where all service providers can use the central network infrastructure to offer their services. Fiber-optic network: The network of fiber-optic cables required to deliver an internet connection into your home, office, local cafe etc. This system uses glass (or plastic) to carry light which is used to transmit information. A critical replacement for copper wires or cable, this is the dominant method of transmitting information for the foreseeable future. Take-rate: The percentage of residents in a defined community who are subscribers to a broadband network. Last Mile (sometimes known as First Mile): Last-mile technology carries signals from the main infrastructure system the short, final distance (hence, the “last mile”) to and from your home or business. Or to put it another way: the last mile is the infrastructure at the neighborhood level — this is the community broadband network! Middle Mile: Middle mile refers to the network connection between the last mile and central internet infrastructure. For instance, in a rural area, the middle mile would connect the town’s network to a larger metropolitan area where it interconnects with major carriers.